 How psychotherapy led to control and ultimate disaster in a West Coast community, narrated by journalist Mithers (author of the much ballyhooed 1982 Village Voice article ``My Life as a Man''). In 1967, Arthur Janov claimed to have found a cure for neurosis through regression to the infant state, culminating in what he called the ``primal scream.'' A few years later, Joe Hart and Riggs Corriere led a group of defectors from Janov's Primal Institute to set up The Center for Feeling Therapy, where people would not only confront their past pain but move beyond it to change their present lives through the breakdown of their defenses and the discovery of their ``true'' feelings. Soon, the therapists formed a kind of hierarchy and assumed more and more power over the patients. Public confessions were demanded and individuals were humiliated (``busted''), and even physically brutalized. 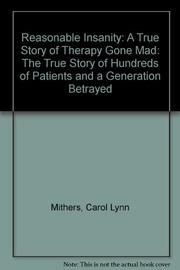 Mithers tells how the therapy became a whole way of life and participants lost contact with the outside world as they formed a tightly connected community of ``the sane.'' As the 70's progressed, therapists would determine what was reality, keeping women, for example, submissive and virtually starving in order to be thin and ``feminine.'' Women were also forced to engage in assigned sexual encounters and undergo abortions as the therapists required. Mithers discerns a pattern of young, impressionable people caught up in a relentless dynamic of transference and the dream of an ideal community. To leave it, they believed, would literally be suicide. Mithers writes with massive detail, gained from first-hand contact with 48 members. The group began to fall apart when Joe Hart quietly left, but not without noting disturbing similarities in the Center's methods to Dr. Louis West's analysis of brainwashing: a process of debilitation, dependency, and dread. The end came when the therapists were absent for two months and patients began to ask questions, such as ``Where is all the money?'' Nearly a decade of lawsuits were to follow. A terrifying story, brilliantly told, as well as a commentary on American culture during the 1970's.